The 802.11n standard is the new generation of wireless networking, delivering better speed, range and reliability to support bandwidth intensive applications. 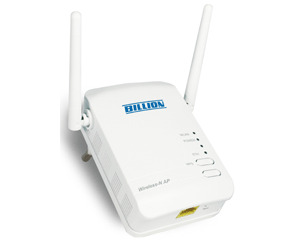 It supports data rates up to 300Mbps and is backward compatibility with 802.11b/g equipments. With an integrated 802.11n wireless access point, the adapter can bridge wireless connections of up to 6 times the speed and 3 times the wireless coverage of an 802.11b / g network device. With simple configuration of the BiPAC 3100SN, users can simply connect to their peripheral devices by selecting the bridge mode, or set up a further wireless network, sharing with differnet IPs by using the repeater mode. Easily set-up, robust security features! The Wireless Protected Access (WPA-PSK / WPA2-PSK) and Wired Equivalent Privacy (WEP) features enhance the level of transmission security and access control over Wireless LAN. The device also supports the Media Access Control (MAC) data communication protocol and the Wi-Fi Protected Setup (WPS) standard to prevent unauthorized access to the network. Users can easily set up the security by pressing the Wi-Fi Protected Setup (WPS) button.